As navigator in the Annapolis to Newport Race (A2N) 2017 aboard the J/120 Shinnecock, Jim Praley was disappointed to be nipped for class honors by the smallest of margins. 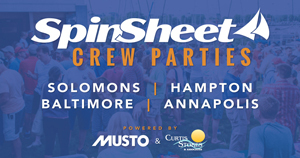 Host Annapolis Yacht Club has worked very hard to introduce its signature event to a new audience, so the success story of Rosalita was very encouraging to organizers. Hanson may have been encouraged give A2N a try after attending a series of seminars that helped first-time participants prepare for the passage between two of the most historic seaports on the East Coast. AYC has posted the Notice of Race and is now officially accepting entries for the 37th A2N, which starts June 7 and 8 on the Chesapeake Bay. Find NOR here. Naval Academy Sailing Squadron and Ida Lewis Yacht Club. Now, Storm Trysail Club, founded in 1938 and dedicated to blue water sailing, will lend its expertise. Praley also announced the addition of ORC scoring for the 2019 event. This past year, Annapolis Yacht Club added the handicap rule developed by the Offshore Racing Congress for all its big boat events and this decision merely continues that commitment. Starting sequences: One of the more popular alterations AYC has made to A2N has been separate starting sequences based on handicap ratings. Smaller and slower boats will start on Friday, June 7, while the larger and faster boats will start on Saturday, June 8. This format has succeeded in getting the entire fleet into Newport in closer proximity and led to increased attendance at the prize-giving ceremony. Praley emphasized that both the Friday and Saturday start fleets would sail the exact same course with boats being required to round Chesapeake Light in the Atlantic Ocean before turning north toward Newport.